This is the bells and whistles, the staggering top dog of the Seat Leon range. The most powerful, most focused and most extreme variant of the brand’s Ford Focus rival. It comes equipped with the same turbocharged 2.0-litre engine as the sub-supercar Volkswagen Golf R, as well as a whole host of performance hardware to make a base-level Porsche Cayman sound under-gunned. The car’s engine produces 306bhp, identical to the Golf R, but there’s no Haldex clutch to juggle power between the front and rear axles here because the drive is sent exclusively to the front wheels. Torque is controlled through an electronic locking differential that’s taken straight from the Cupra 300. Point to point, even on a bumpy road, the Leon Cupra R can make ground as fast as anything else with seatbelts and a hooter. 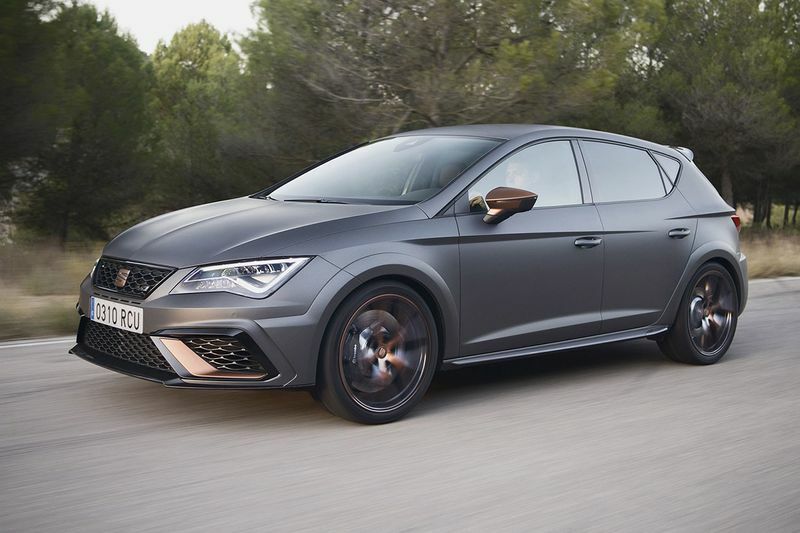 It doesn’t chew into the tarmac under power on corner exits like a Golf R – with two-wheel drive, of course, it can’t – but the front wheels bite into the surface with such fantastic levels of traction that the Cupra R’s rampant powertrain can be exploited with enthusiasm. The Cupra R is very obviously more concerned with being driven like your hair’s on fire, so charge into a corner on a trailed throttle and the front end will respond eagerly. The extra negative camber (it’s been almost doubled) allows the car to really lean into its front tyres, encouraging the back-end to over-rotate a few degrees. It’s not as laugh-out-loud mobile as the Honda Civic Type R or Renault Sport Mégane (which benefits from four-wheel steering), but it gives the car a more loutish demeanour. That’s matched by the engine’s tone, which sounds more aggressive than the Golf R’s thanks to a less restrictive (in terms of volume) exhaust that beguiles with snap, crackles and pops off throttle when the car’s set to its top Cupra mode – which is new for the R. Even more satisfying is the snort of overrun when you pull for a quick upshift through the car’s tightly-gaited six-speed gearbox. Certain countries like the UK aren’t offered a dual-clutch automatic like other markets, but on the other hand, most Volkswagen Golf R owners wish they could opt for a manual box to be engaged with the car more, even though a DSG is fantastic nevertheless. The engine is VW Group's 1984cc, 4 cylinder turbocharged petrol unit pushing 306bhp at 5800-6500rpm and 280lb ft of torque between 1800-5700rpm. The 6-speed manual gearbox helps the Cupra R to a top speed 155mph, while the 0-62mph is done in 5.8s.